"Therefore shall a man leave his father and his mother, and shall cleave unto his wife: and they shall be one flesh" (Genesis 2:24). 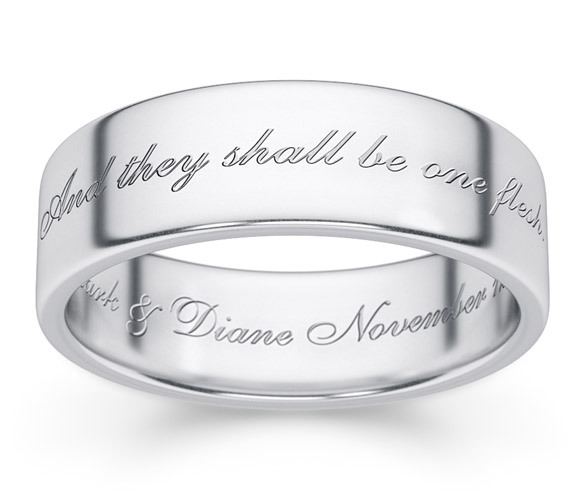 Portions of the Bible verse about marriage - "And they shall be one flesh" - is inscribed on the front of this .925 sterling silver wedding band ring. The ring is also personalized with your names and wedding date or any inscription of your choice engraved on the inside of the silver wedding band. The sterling silver band measures 6mm (shown) and is also available in 7mm or 8mm width. The ring is available for both men and women, depending on the ring size you choose. Also available in 14k gold or white gold (shown below). We guarantee our "One Flesh" Genesis 2:24 Sterling Silver Bible Verse Ring to be high quality, authentic jewelry, as described above.